That's what it feels like lately. Lots going on here. We are moving to Round Rock, Texas. That's right next to Austin in case you don't know. Did I tell you that? It's not because we have had it with Minnesota winters. Although, after this last one, that would be a viable reason. It's because my husband lost his job last June and landed a job with Dell computers. He started at the end of September and has been living there while I am living here in Minnesota with my 2 teenage boys. My daughter is away at college and comes home about every other weekend. It's been a tough year. Living apart and raising two teenage boys on my own has been difficult. My husband tries to get home every other weekend. We are trying to get our house ready for sale. I'm overwhelmed with what needs to be done to make our house ready. Every one has gone through ups and downs with how they feel about this move. My husband is the one who wants to move the least. Minnesota is where all our family and friends are. I am staying open to the change and try to look at it as an adventure. I have heard great things about the Austin area! Doug took me on a cruise for my birthday in February. It was fabulous to take a break from all of this stress and from the frozen Minnesota tundra! Less than a week later I was back on a plane flying to Austin to look at some possible houses that popped up on the radar. Our list of what we want in a house is long. There has to be a craft room for me and a workshop for Doug. The boys have their own ideas about what are must haves. A pool would be nice. A big kitchen, open floor plan, guest room, workout area, etc. You get the idea. It can be tough to find all that in the price range and area we want. We found two good viable options for houses. We put an offer on one of the houses. It's a short sale so it could take awhile to hear back. In the meantime, I'm still working at my full-time job during the day, playing taxi driver at night, trying to keep up everything and keep stamping in my life. Thus the going around in circles! I must really have had circles on my brain because the Recipe cards I came up with for this month's recipe club all had to do with circles! It's a Caesar Salad recipe. Lots of circles going on here. the circles are stamped and punched out with the 1 3/4" circle punch and lined up along the recipe card. I trimmed off the edges to give it the look of continual pattern. The fringe is made with the fringe scissors. This scissors has been so popular that Stampin' Up! is sold out and working with our vendor to get more! The chevron ribbon is layered with the Pistachio Pudding ruffled ribbon and placed on top of the fringe. The flowers are stamped in versamark and punched out with the flower shop punch and coordinating stamp set. The circle the flowers sit on is the 2 1/2" circle. The starburst framelit set is the shape behind it. The second recipe card is a bit more involved. It is for Pineapple carrot cake. The designer paper used on this card is called Retro Fresh Designer Paper. The pineapple is made with the Oval framelits. I ran it through the bigshot with the honeycomb embossing folder and then inked it with Early Espresso ink. The leaves are made with the oval punch. The third recipe card is for Baked Sandwiches. These are so delicious! Do you notice the circles? I punched out 1 inch circles out of patterned paper, tacked them down with adhesive and then sewed them to the page with a zigzag stich on my sewing machine. The corrugated piece is from a piece of cardboard from a Stampin' Up! box. I pulled apart the top layer and sewed it to the page. I stapled the orange ribbon on each side of the page. That was a long post! That's what happens when I don't post for a month! I hope to blog a little bit more often. Even during our crazy move process. Do you have any tips about moving a long way from home? Do you know the Austin area? I would love to know more about it. After a hiatus of a year or so I have started up another monthly Recipe club. To kick off the first session, I made three recipes for the group and designed the 8 x 8 recipe cards for them. These are 8 x8 recipe cards. I like the bigger size as it gives me more options for designs. The first card was for a dessert. I made a punch art cake and did a tulle skirt across the page much like the Christmas card I posted awhile back. This is crumb cake tulle and it is available in the Clearance Rack on my online ordering website for only $2.79 while supplies last! This Crunchy Asian salad recipe card was made with a combination of stamping and punches. This Crockpot Beef Stroganoff Recipe card is based off of a card my downline, Angela, created for here Recipe club. I created a pot that has a lid that holds the recipe when you lift the lid. I love interactive pages! I hope your Holiday preparations are going well. I have much to do to prepare for a back to back celebrations on Christmas Eve and Christmas day with my husband's side of the family followed up by my side of the family. Such great pleasure hosting the holidays for our families! This was one of the recipe cards for our February stamp club. I got the tall cake idea from somewhere but I can't remember where. The "frosting" is the silver glimmer paper. It is punched out with part of the square scallop punch. The cake stand is made with the word window punch and tag punch. This cake was so yummy! I'm not normally an Angel food cake fan but with this yummy frosting it was delicious! We are having a family party for my boys' birthdays this weekend. They turn 12 and 14 in March. I'll be making some yummy new recipes I found from Pinterest. I'll share them here if they turn out as good as I'm hoping! I like to try new recipes, don't you? But I don't like going through all of the work of making a new recipe only to find my family and I don't like it. That's one of the reasons I love my recipe club! I have 5 or 6 ladies who switch off being hostess. The hostess provides 3 recipes for me ahead of time which I create 6x6 recipe cards for. On the day of recipe club the hostess makes her recipes for the rest of the club. We all get to try her recipes and then everyone creates the 6x6 recipe cards so they can take the recipe home. You get to taste the recipe to decide if you would like to make it yourself and get some fun stamping time in. It works for me! Here are the 3 recipe cards I created from this month's hostess, Beckie. I went for a sophisted look on this one with the recipe printed on River Rock cardstock, and the striped designer paper from the Mocha Morning Specialty pack. I used the new Apothecary art stamp set and labels collection Sizzix die both from the new Occasions mini catalog. The veggies are from the stamp set, Homegrown. I used my new favorite ribbon from the mini the pleated ribbon! This one is in Riding Hood Red. the stamp set is Fruits and Flowers. Colors used are Early Espresso, Whisper White, Pear Pizazz, Daffodill Dellight, and Riding Hood Red. Can you see the subtle stripe of the stripes embossing folder beneath the fruit? I have been itching to use this stamp set with my recipe cards and I finally did. This one uses the designer paper, domestic goddess. The stamp is a single stamp called Now You're Cookin'. I see lots of possibilities for this one. I used the labels die cut again and backed it with the 2 1/2 inch circle punch. Colors used are Basic Gray, Calypso Coral, Pool Party, Daffodil Delight and Whisper White. I hope you enjoyed these. Thanks for stopping by today! Hi all! We got snow for the first time this season. I was in LaCrosse with my daughter, visiting my sister, Geri for the weekend. We didn't get any snow in LaCrosse but on our drive back we slowly drove into the snow. It wasn't much. Just enough to stick to the ground and make the roads slushy. I think it's all supposed to melt by Thanksgiving. We had to get back early today because I had Recipe club this afternoon. Bonnie was the hostess and she brought 3 delicious items. The main dish was Pizzaoli. This was deeelish! Here is the recipe card I created for it. The chicken is made from the owl punch and a few other punches. The idea came from Michelle Scileppi. I can't tell you how many different punch art chickens I have made for my recipe club cards. It's always good to find another one. I love the clever way Michelle adapted the owl punch to become a chicken! The designer paper is the oh-so-cute, Domestic Goddess. I have been itching to use this paper and found just the project. The ric rac is made from the Tasteful Trim Sizzix die. I can't stop using this die! I'll post the other recipe cards we made in club over the next couple of days. Tune in to my online website tomorrow. Stampin' Up! will have some fantastic Clearance rack deals! At long last I have the chicken punch art I have been promising. I made this recipe card for my recipe club. The chicken was made using the Pennant builder punch and few others. This chicken was made using the pennants punch for the body. I punched the triangle and then rouned the 3 corners with a 3/4" circle punch. 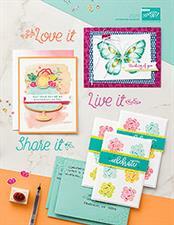 The bird punch is the wing, the daisy Sizzix die is the tail feathers and the rest uses the Boho blossom punch. I used the largest blossom and trimmed it for the headpiece, the beak and the waddle. It's pretty easy. I hope you enjoy it! It's pizza and pumpkins for us tomorrow night. We are going to pick out our pumpkins and carve them for Halloween. Friday night is always pizza night at our house and it fits in with the busy night we have ahead of us! I have the other two recipe cards to share from my Recipe club last week. The first is a bagel dip and it is so addictive! I could eat it all day. It has Accent in it, which I guess is MSG, so I intend to make it with seasoning salt as a replacement. The last one is a light and refreshing dessert recipe. It's made with Lime Sherbet and creme de menthe and topped with whip cream and a maraschino cherry. It looks so pretty! I should have taken a picture of it. 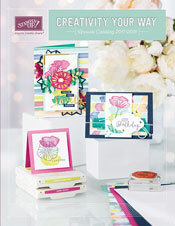 The stamp set is called Slice of Life and is a level 1 hostess stamp set from the Occasions mini catalog. You have until the end of April to earn this set for Free! How do you earn it? By hosting a party, book party, or placing $150 order yourself! You can order through me on my online ordering website here or by contacting me at kathleen@myhappystampingplace.com. We're still battling winter here in Minnesota. We got more snow yesterday. We were enjoying a warm up for awhile - temps in the 50's but winter isn't quite done with us yet. It doesn't get to me as much in March because I know it's not sticking around for long. Scalloped potatoes and ham. Doesn't that sound delicious? This is one of the recipes my hostess will be bringing over today for recipe club. I can't wait to try it! Here is the recipe card I created for her recipe that my club members will all get to make. I gave it a vintage feel because it seemed to fit this recipe. I based all of the colors off of the designer paper. That way everything coordinates! It's my son's 13th birthday today. Now I have two teenagers in the house. They are growing up on me too fast! No, I didn't sneeze(katsu!). That's the name of this dish. This was one of the cards for my virtual recipe club this month. I haven't had a chance to taste this yet but I am intrigued to try it. The punch art chicken was cased from another demo who cased it from Lynn Pratt. Punches used for chicken: 2 1/2" circle punch, large scallop circle punch, scallop circle punch, modern label punch, circles for the eyes from the owl punch, heart from heart to heart punch, beak is from the large star punch and head thing-a-ma-bobby is from the scallop oval punch. We're still digging out from all of the snow we got hit with in Minnesota. We Minnesotans are used to this by now. It doesn't slow us down for long. Someone asked me yesterday if UPS was going to be able to get to us with all of this snow we were having. I assured them it's business as usual here. Yesterday was my Recipe club. However, Minnesota was dumped with a boat load of snow and we had to cancel. I decided to do a virtual recipe club instead so I made up all of the recipe cards for my club members and they are sending me their orders for the month. I wanted to explore some different colors and have it be fruit oriented so that's where I came up with these colors. I wanted to mix it up a little so I used some cordurouy fabric as part of the die cut flower. We're still accumulating snow here. This Minnesota winter just wont end!